This easy crochet super scarf is warm, cozy, and l-o-n-g–all the things a super scarf should be! Also, the lacy details add elegance, and will keep you looking gorgeous all winter. 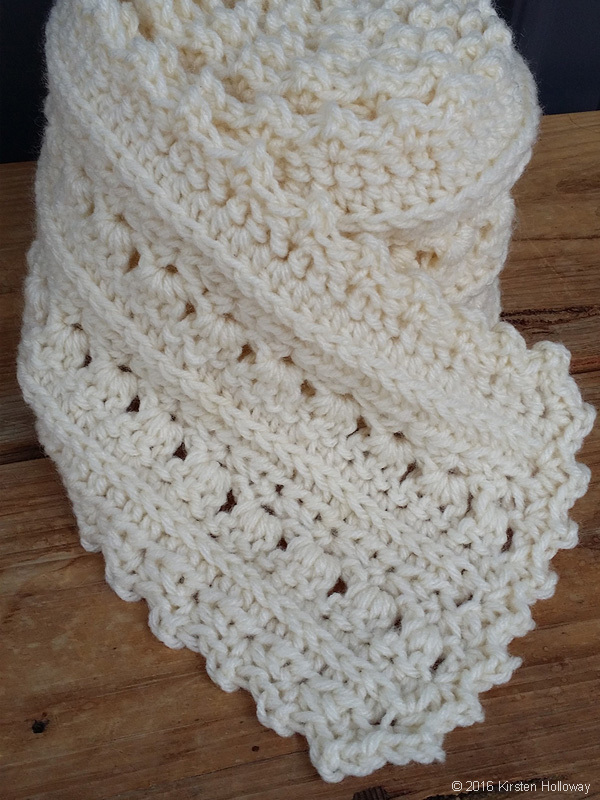 Because this super scarf is so versatile, it can be made in a variety of lengths; and it is so easily turned into an afghan with enough row repeats. If you want to make a set, then find the matching slouch hat here, and the fingerless gloves here. 5.5mm (I) hook, or hook needed to obtain measurements. Stitching in the “3rd loop” of hdc. After turning, work all stitches for that row in the 3rd loop of the hdc from previous row (it will be in the front). Instructions: Look at the top of the stitch, and locate the sideways “V”, bend the stitch to look at the back, and you should see another “V”. You’ll be working into the back loop of that “V”, this is called the 3rd loop. 8 ft long (based on a starting chain of 301) by 6″ wide. -Several people have asked how to shorten this pattern. 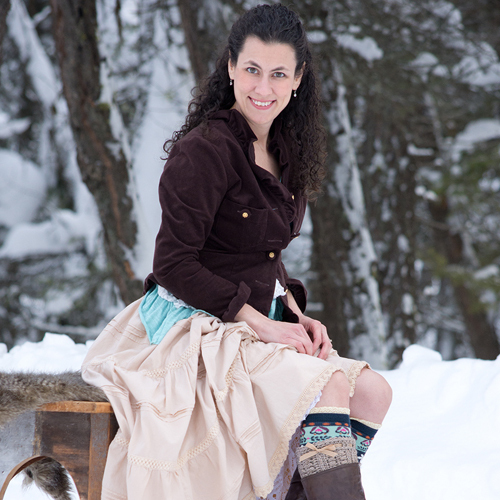 Try 192 stitches (193 chains) for a 5′ scarf, and 228 stitches (229 chains) for a 6′ scarf. You could even make a longer scarf, just make sure your starting chain number is divisible by 3 + 1 (the first two chains of the row count as a stitch). -Ch 2, and ch 3 do count as first stitch of row unless otherwise indicated. -With the previous note in mind, I’ve put turning instructions at the beginning of the row to hopefully make things easier for beginners working this pattern. This keeps rows all together. Your scarf should measure about 3 1/4″ wide, and 102″ long at this point. You can continue repeating rows 3-6 again* or add the edging. *You could even keep repeating this pattern until you have an Afghan! After finishing row 6 repeat, ch 1, turn, and sl st over into 2nd stitch of row, [sc, ch 2, sc] in 2nd stitch, *skip 2 stitches, [sc, ch 2, sc] in next Repeat this pattern around the outside of the scarf. When you get to corners you should have 1 stitch left, sl st into it and start your next [sc, ch 2, sc] group in the first stitch along the edge. With 2 repeats, and the edging added, my scarf measured about 6″ wide, had 100 “bumps” along each side and 8 across each end. Join to first sl st.
Cut yarn, and then weave in ends. Friends, if you enjoyed this pattern, then don’t forget to sign up for my newsletter here! That way you’ll never miss out on special events, or freebies I’m offering. You can also find me on Facebook, Pinterest, Instagram, and Ravelry! You are welcome to share the link to this pattern, using one image of your choice, on your site, but please do not share the written patterns themselves, or use additional images. Also, you never have permission to use my images by themselves on Pinterest, however they may be included in a roundup pin if there are 4 or more other patterns. If you sell finished items online, then please do not use my pictures for your listings. I’m positive that your work is of high enough quality for you to sell the finished piece. So, have confidence in your abilities! <3 Thank you! This pattern was made to be used by individuals, and also small business crocheters. So, selling your finished pieces in boutiques, at farmer’s markets, craft shows and other events is encouraged! Please credit Kirsten Holloway Designs when selling finished products online. The only thing I require is that this pattern not be used commercially to produce millions of copies. This post contains affiliate links. So, when you purchase something using these links a small amount of the sales price goes to me to help keep this site, and the patterns on it free. Although, you do not pay any extra for the item you purchase. How cool is that?! 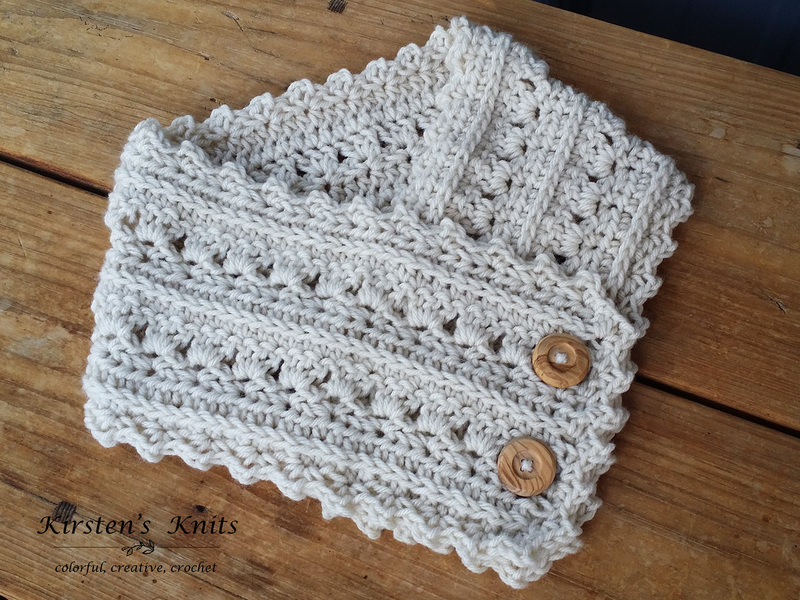 The Primrose and Proper Cowl: Find it on its own page now! Again, you are welcome to share the link to this pattern, using one image of your choice, on your site. However, please do not share the written patterns themselves, or use additional images. Thank you! 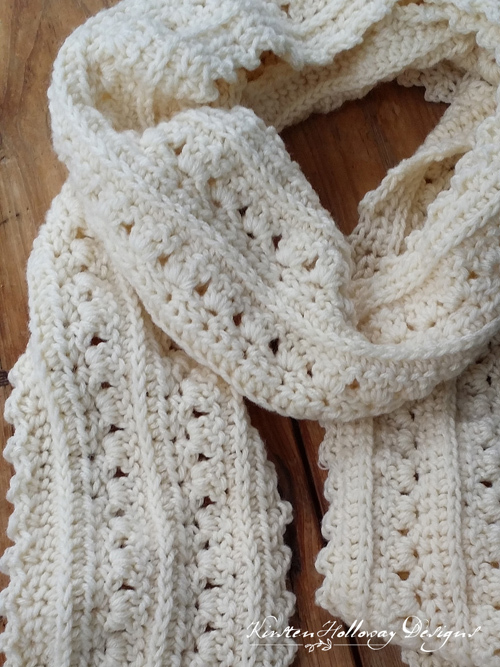 This super scarf pattern was made to be used by individuals, and also small business crocheters. So, selling your finished pieces in boutiques, at farmer’s markets, craft shows and other events is encouraged! However, the only thing I require is that it not be used commercially to produce millions of copies. This is so elegant, am will put on my list to make. Just bought some yarn that will work up real pretty with this pattern. Thanks for sharing. You're welcome! I've seen people make it using a variety of yarns, and each one has turned out beautifully! Do you slip stitch into the chain 2 at the end of each row? Can't wait to make this one soon! Thank you!! Love this…so pretty !! I am going to try the cowl with a Caron Cake ! I made the scarf and get a lot of compliments! It’s my favorite! The only thing is that the ends are not straight! Can you offer any advice? Im glad to hear you are getting lots of compliments on your scarf! The most important thing to remember about this pattern is that the ch-2 or ch-3 at the beginning of different rows counts as a stitch and should be worked into on the next row. Some people have missed it and had their projects turn out crooked/slanted. The most fun I've had in ages, it really is a delight to do. Thank you, thank you! Awesome! I'll go check it out! Hey Kirsten! I have a question for you. What is the 3rd loop? Without pictures it is hard to explain, but the top of a stitch is made of 2 opposing loops/strands, right? So, looking at the stitch from the back of it, we see one of the top strands, then, working downward, another strand (a back strand), next we see another strand, it is a smaller, tighter one, and finally, there are 2 more opposing strands below that (these sit pretty much vertical). These are the strands that we see from the back. If this made any sense, could you tell me which loop is the "3rd loop". All right, thanks a bunch! I have the same question about the third loop. Canot you explain it further or share a photo? Thanks! Thanks, I wasn’t sure if it was the front 3rd loop or the back third loop. In your additional terms above, it says the third loop would be in the front, but your instructions said to search for it in the back. I’m going with the videos and using the 3rd loop in the back. Thank you! This helped a lot. Beautiful pattern. So fun! I'm making my second one. What a great pattern! Thanks for sharing!! Qick question – In your comments you say to make sure your starting chain is divisable by 3 – But 302 is not – so how can it work out correctly? The pattern is multiples of 3, plus 2 for your starting stitch, however, if you count the end chains as a stitch, you can actually get away with doing 301. Hope that clarifys things! Love this scarf, so pretty. I am having trouble with the stitch count though. In Row 4, the 100 'bumps' created only leave you with 250 stitches + 2 hdc at the beginning and at the end: 252 stitches in total. Next row is all hdc but of course you only end up with 252 stitches not 300. To me, the only way to get the proper count is to do 3 hdc for each 'bump'. thanks in advance for your help! The Each "bump" except for the first, and last, should have 3 dc in them. The bumps on each end are the only ones that get two dc (plus the chain 2 or dc that is the very first and last stitch of the row). I hope that helps! LOVE this, just made if using Lion Brand Landscapes yarn in Desert Spring. Turned out absolutely gorgeous! Just tried it. Love it so much. Working it into a baby blanket. Hi Joanna, each ch 2 space, except for the first and last spaces in the row, get 3 dc worked into them. Think of the "bumps" as eyelets and you are working 3 dc into each eyelet. 🙂 I hope that helps! I looked at the YouTube video mentioned. Tamara talks about using the 3rd loop in the back…am I right that for this scarf pattern we do want the 3rd loop in front?? How many skeins or ounces does it take for 500 yards? I haven't crocheted in years but ran across some beautiful yarn on sale that I had to have. Love this pattern, hope 6 skeins is enough. From the conversion information I've found, worsted weight yarn weighs 1 oz. for 50 yards, so you'd need 10 oz. to complete this scarf. 6 skeins of worsted weight yarn should be plenty, providing they are more than a couple of oz. each! Good luck! Thank you! I can't wait to start it. Do you work in the front of the hdc 3rd loop or the back? Can't wait to get started on this beautiful scarf! It is the back of the stitch, however, because you will be turning at the end if the row, the back of the stitch will actually be facing you as you work into the 3rd loop. 🙂 Hope that helps! You're welcome! someone else made a blanket from this as well, and it turned out cute! I'd love to see your blanket when you get done with it! I would love to make a hat that matches, but drawing a blank on how to do it. I am on row 5 and love it so far!! Going to be hard to part with this one. The front and back loops are at the top of the stitch. The 3rd loop as used in this pattern is behind the stitch, so when you turn at the end of the row, it will be facing you. Here is a video where I demonstrate it: https://www.facebook.com/kirstenhollowaydesigns/videos/1884031391814874/ The “sideways V’s” I talk about are the commonly referred to “front loop” and “back loop”. The 3rd loop is different. I hope that helps clear things up! I’m sorry you’re having issues, Keli. I have no idea what could be causing a slant if your stitch count isn’t off, and you’re starting the design in the same stitch for each repeat. Perhaps you could try blocking it when done? When you refer to the 3rd loop is it the front or the back 3rd loop? I watched the video and it explained it really well but the pattern does not specify front or back. Hi, I’m having trouble understanding row 3. Im a beginner so it’s my bad. Is there a way to write it clearer? I’m sorry you’re having trouble. Try taking it one step at a time (the steps are separated by commas, and broken down further in brackets). So for the first stitch, chain 2, then move to the next stitch and work the sequence: “one single crochet, chain 2, then one more single crochet in that stitch”, next you’ll skip 2 stitches, and repeat the sequence you just did in that next stitch.Keep repeating this until the end of the row. When yo reach the end of the row, you should have one stitch left (it’s the top of the chain from the chain 2 you did at the beginning of row 2), and you’ll work a half-double crochet in the top of that chain. You will have a whole row of little bumps (or loops depending on how you look at it), which will be what you work row 4’s stitches into. I hope that helps clarify a little better! I get it now ? . Thankyou soooo much. It’s too pretty not to make. I want to make one for my MIL and my girls aswell as myself. Hi Selina, your previous row should have called for you to do a [sc, ch 2, sc] in the same stitch, this next row is telling you to work your dc stitches into that ch 2 space from the previous row. Hi Amanda, the reason it says to go into the 3rd chain from hook is because the 2 chains that you skip (not including the loop on your hook) count as the first stitch. 🙂 I hope that helps clarify. If you Crochet in 3rd chain from hook you end up with 299 not 300. 301-3 is 299. It should read Crochet into 2nd chain from hook. Per your instructions you should have 300 HDC’s. I’m so glad it makes sense now, and hope the rest of the project goes smoothly! When I started this, I thought I understood the pattern (I’m not terribly good at reading patterns to begin with), but after putting it down for a month, it’s making no sense to me. When you say the 3rd loop, you say it’s in the front but then say you’ll be working into the back of it. I don’t quite understand that. And maybe I did it wrong, but my V is in the front of my work now; after the 5th row. I’m also assuming the pattern repeats. After which point does it repeat? I hope that helps make things easier for you! Thank you very much! I didn’t really want to have to undo the whole thing lol. Thanks so much for this pattern! Have been searching for the perfect one to make for my grown daughter and was about to give up. This is perfect and I am making some fingerless gloves to go with it. And I am considering making one for the BFF too for her birthday in December. Love the instructions and since I am a more visual learner your videos have been tremendous help. You’re very welcome, Carol! Have fun making it! I’m sure your daughter, and your friend will look beautiful in their scarves! Gorgeous! saving this to use in the near future! the yardage of those suggested yarns would mean about 1 and a half skeins of them, right? Hi Kirsten: In the Edging instructions it says Edging: After finishing row 6 repeat, ch 1, turn…. Does that mean I do row 6 twice? Sorry, I’m new at crochet. Thank you for the beautiful pattern! Absolutely making and gifting a few of these…thank you so much, it is beautiful! I’m from the Philippines so with our climate we seldom use a scarf. This is the first scarf I crocheted; made this primrose scarf as a Christmas/birthday gift for a friend who is based in China where the scarf would be of more use. Love this pattern! Took me a few tries to figure it out, but I’m glad I stuck with it, turned out beautifully! Yay! I’m so glad you are pleased with how it turned out! I made this scarf for myself last year and absolutely love it! I just made six more for my co-workers this last month. This just popped up in my Facebook feed from last year and I’m so glad I found it. I wanted to say thank you for the pattern and I can’t wait to try your other patterns and make the hat! Stephanie, that’s wonderful to hear! You’re very welcome. 🙂 Happy Crocheting! What is the gauge for the scarf? Thanks! On row 5 after turning, do I go to the next stitch or the one at the base of the ch 2? On row 6 you say next back loop – is that the first one I see? Sorry – just want to get it right. Love this scarf! You will go into the next stitch on row 5, since the ch 2 counts as the first hdc of the row. For row 6, take a look at this video: https://facebook.com/kirstenhollowaydesigns/videos/1884031391814874/ It should help you out! Good luck on this project! First of all thank you for a lovely scarf which I have just finished, it is beautiful. I have now started the hat to go with it and there is one thing I’ve noticed when I crocheted the scarf and is now happening with the hat. The edge where the tail is (where I begin the foundation chain) that edge is not straight it ends up going slightly angled and seems to happen around the ending of rows 3 and 4 even though the number of chains are correct. I don’t know why this is happening and I thought it would right itself when I did the edging but it hasn’t . It’s now happening with the hat and my concern is it will be crooked when I join the seams. I’m not sure what to do….have you any ideas as to what I’m doing wrong? The only thing I can think of that could be causing a slant is that you might be placing the first stitch or last stitch of the row in the wrong place. The chain 2 for the hdc rows counts as the first stitch of the row, so you’ll want to make sure you are working the final stitch of the next row into the top (2nd ch) of that ch 2. It should stay straight that way, and turn out just like the pictures. 🙂 I hope that helps! You’ll have a hdc in the first stitch of the row, then right after that, in the following stitch, you’ll work the (sc, ch 2, sc). There should be 11 bumps in row 5 when working the larger sized hat. The edges should be pretty straight, so I don’t know why it’s slanting for you. Hopefully this helps you out!